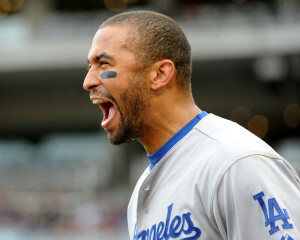 Just when you think Matt Kemp is ready to play again, he suffers another injury. I could almost feel Dodger fans collectively roll their eyes over all forms of social media on Friday, when they discovered Kemp pulled his hamstring again. This latest setback could end Kemp’s season, which has been a train wreck. Even Andrew Bynum thinks Matt Kemp gets hurt a lot! Kemp had been recovering from a sprained right ankle, which he suffered on July 21st, against the Reds. This was his third extended trip to the DL this season, as he has battled shoulder and hamstring issues all year. He started a minor league rehab assignment about a week ago, but struggled harder than Charlie Sheen does after a Saturday night bender. Kemp was 0-18 with 7 strikeouts while playing single A baseball. His performance was so atrocious, he was sent to Arizona to rehab at the Dodgers spring training facility instead of being a part of the minor league playoff roster. With Yasiel Puig in the Dodgers lineup it sounds like Colletti isn’t just moving on. He sounds like he just dumped his girlfriend who’s gained a few pounds for Kate Upton. Considering that Colletti signed Kemp to a 7 year $160 million deal last year, I’m not sure how easy that break up will be. The Dodgers may feel that they can get by without Kemp for the rest of the year, but lets not lose perspective here Dodger fans. Kemp is an unstoppable force when he’s healthy, and it sure would be nice to have his bat in the World Series, especially with the DH. LA may be giving up on his return, but Kemp isn’t. Today, he took 15 swings in Arizona, and might try running tomorrow. Time is running out this season for Kemp to return and make an impact, but he certainly cares a great deal, and wants to help this team win the World Series. You also can’t underestimate his leadership in the clubhouse, and how much his teammates respect him. I keep hearing from Kemp’s critics that he doesn’t have good fundamentals, and doesn’t play hard. I don’t hear any of these critics talk about Yasiel Puig’s game the same way, even though he never hits the cutoff man. The Dodgers have the luxury of having 4 good outfielders, and that’s important because all 4 are very high risk to injury with their style of play. I sure hope the Dodgers think long and hard about that before trading anyone this winter. This entry was posted in Dodgers on September 8, 2013 by omzzzzz.